Babyleo delivers a unique combination of three different heat sources – ensuring optimal thermoregulation for neonates during open and closed care and transition. With a mission to provide every newborn with the best start to life, Dräger has redefined neonatal care with the FDA-cleared Babyleo TN500, a new IncuWarmer. Dräger conducted extensive research to identify the optimal conditions for pre-term babies to thrive in the NICU, and designed the Babyleo to provide the best setting for neonatal development – taking into account the baby’s own environment, family involvement and clinical workflow. Babyleo delivers a unique combination of three different heat sources – ensuring optimal thermoregulation for neonates during open and closed care and transition. 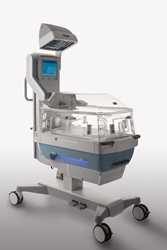 The IncuWarmer also features a family centric design and easy, efficient workflow for care teams, creating beneficial developmental and neuroprotective conditions for neonates in the NICU. Keeping babies in a thermal-neutral zone ensures that caloric expenditure is focused on growth rather than keeping the body warm. Babyleo is the first IncuWarmer to provide thermoregulation from three heat sources, including convective and radiative heat, as well as conductive heat directly from the mattress. At a minimum, two heat sources are always working and synchronized to automatically adjust to be more active at certain times. Studies have shown that early weaning protocols of preterm infants – from incubator to open crib – significantly reduce length of stay, improve parent bonding and reduce exposure to infections (1). Dräger designed the Babyleo to support and streamline this critical process. As the thermoregulation needs of neonates change, Babyleo’s weaning mode helps automate weaning of patients out of the incubator. This supports caregivers throughout the process and minimizes workload. Lowering sound levels and creating an environment similar to the womb can help minimize stress to the infant, which is beneficial for a baby’s cardiovascular, respiratory, neurological and endocrine systems. Babyleo mimics the environment of a mother’s womb as closely as possible, keeping operating noises and light to a minimum. A built-in monitoring system allows the levels of light and sound exposure to be easily monitored, effectively helping reduce stressors that can have a harmful impact on neonatal growth and increasing those that facilitate development. A study (2) found that promoting family involvement in the NICU is more likely to produce a positive impact on a baby’s long-term physical, cognitive and psychosocial development. During the design process, Dräger worked closely with parents of NICU patients to ensure the Babyleo allowed for parents to physically stay as close as possible. Height adjustments and knee pockets accommodate mothers in wheelchairs, and the “kangaroo mode” supports parent-baby bonding. The IncuWarmer’s patient monitor instantly displays information in easy-to-understand terms, and an integrated audio function allows for music or voice recordings to be safely played to create positive stimuli. To optimize access to the baby, Dräger conducted a workflow analysis of the NICU to identify key procedures of the entire cross-functional team. From the most basic to critical situations, the stability of the thermal environment is maintained. Soothing, ambient downlight is used so parents and clinicians can safely navigate around the IncuWarmer without having to turn on bright overhead lights. When the baby is moved out of the incubator for cleaning, USB connections allow for the quick downloading of device settings to new devices. For more information, visit http://www.draeger.com/babyleo. Babyleo is manufactured by Drägerwerk AG & Co. KGaA. Dräger is an international leader in the fields of medical and safety technology. Our products protect, support, and save lives. Founded in 1889, Dräger generated revenues of more than EUR 2.5 billion in 2016. The Dräger Group is currently present in over 190 countries and has more than 13,000 employees worldwide. Please visit http://www.draeger.com for more information.